IIC’s innovative real-time 278 authorization engine is designed for health plans to automatically adjudicate all medical authorization requests using the EDI 278-275 standard. It auto processes all PA requests and provides real-time responses following the mandated criteria for those submissions. IIC’s solution is unique based on its compliance with the EDI 278-275 standard, mandated under the Affordable Care Act (ACA), and makes 278 transactions useful, not just compliant. It helps payers reduce authorization response times and transactions costs by an order of magnitude. IIC’s 278 authorization engine handles all appropriate member data, including all subscriber files, member benefits, provider contracts, and payer policies. IIC automates all the clinical guidelines the payer uses to approve, pend, or deny PA requests and allows utilization management to scale and expand based on automating the UM process. Payers are able to respond in real-time to the vast majority of prior authorization requests without human intervention, by auto adjudicating requests using EDI 278, based on the payer’s payment policies and clinical guidelines. IIC’s authorization engine is configurable to meet all the health plans authorization criteria. 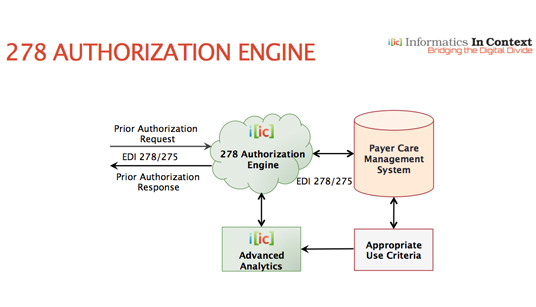 IIC’s 278 authorization engine is the first commercially available auto authorization solution for medicine based on the EDI 278-275 standard. When adjudicated correctly the first time, prior authorization prevents post-service denials, re-adjudication of claims, impacts reprocessing rates, eliminates medical review, and avoids recalculation of member liability. And it assures patients receive the most medically appropriate care based on enforcement of evidence-based medicine. Automated prior authorization responses are based on the payers’ specific policies and clinical guidelines. Clinical guidelines and rules are editable by the payer as they change. Payer realize an order of magnitude savings in admin processing time and cost, along with a dramatic increase in workflow efficiency and administrative simplification. Value of prepayments ties authorization claim to approval code, avoiding the “pay and chase” scenario (i.e. post-payment reviews and denials where payment has already been remitted to the provider). Helps payer maintain member satisfaction ratings, which impacts programs such as Medicare Five Star Quality Rating, etc. Copyrights © Informatics In Context 2015. All rights reserved.